Realistic fake life size bloody human gory flesh color arms, feet and hands props of various lengths include protruding bones at top, and features the end of broken ulna and radius bones poking out the end. Yikes! Fool your friends, family, and guests with these realistic gory bloody body parts with creepy cut off ends. 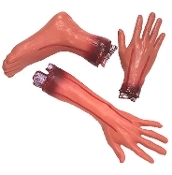 Fake arms, feet and hands make a ghoulishly horrific accessory for haunted house, dungeon torture chamber, mad scientist laboratory, butcher chop shop, meat market, morgue scene and Halloween cemetery graveyard yard decorations. Lifelike enough for stage and theater production or school play. Fun joke accessory for tasteless prank or gag gift! Complete with detailed painting and texturing, these body parts ensure that your party will be a SCREAM!